To prepare batter, in a large mixing bowl cream the butter and sugar. Add the mango puree, egg, vanilla, and lime juice. In a separate bowl, combine the flour, baking powder, baking soda and cinnamon. Add the mango mixture to the flour mixture, stirring until the dry ingredient is just moistened. Stir in the walnuts and diced mango. 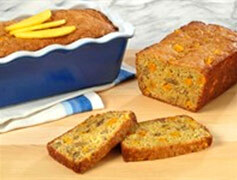 To bake the mango bread, preheat the oven to 350°F. Coat a 9x5x3 inch pan with cooking spray. Pour the batter into the prepared loaf pan. Bake for 40 minutes, or until a toothpick inserted in the center comes out clean. Cool in the pan for 10 minutes before removing from the loaf pan. Allow to cool for 1 hour on a rack before serving. Cook chicken on a lightly oiled grill over medium heat for about 5 minutes on each side or until lightly charred and cooked through. Let cool slightly and cut into bite size strips. Puree the tomato sauce and dried pepper in a blender or food processor. Transfer to a small saucepan and simmer over medium heat for 15 minutes. Add grilled chicken to pan and toss well to coat; season to taste with salt. Place flour tortillas on a flat surface. Top half of each tortilla with equal amounts of cheese, mango, bell pepper, green onion and chicken; fold over tortilla. Cook in a large skillet on both sides until cheese is melted and tortilla is crisp, about 5 minutes on each side. 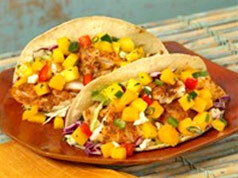 Serve with mango salsa. In a small bowl, stir together mango, red bell pepper, red onion, cilantro, lime juice, and salt. 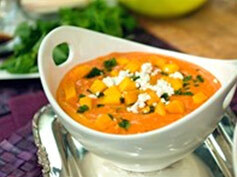 Combine mango and red pepper puree in a medium size saucepan over medium-low heat and heat until warm for 3 to 4 minutes. Slowly stir in goat cheese until incorporated into puree. Season with salt and pepper, cumin, cayenne pepper and fresh lime juice. Pour into serving bowl. 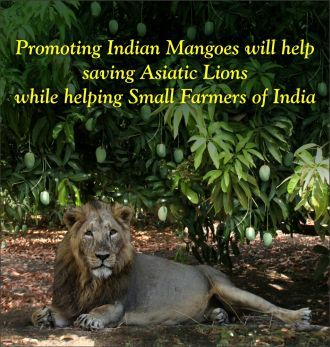 Stir in cilantro and top with diced mango. Spread over toasted bread or serve with arepas for dipping. Preheat oven to 450°F and place pizza crusts on a large baking sheet. 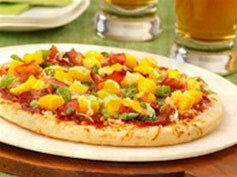 Spread with barbecue sauce, then sprinkle with cheese, bacon, green onion and mango. Bake for 8 to 10 minutes or until lightly browned around the edges. Let cool slightly then cut into small wedges. Preheat oven to 425°F. Stir together mango, bell pepper, lime juice, cilantro, onions and jalapeno in a medium bowl; set aside. Place cod on 2 large sheets of parchment paper. Stir together dry seasonings in a small bowl and sprinkle over cod. Bring edges of parchment paper together and fold twice. Fold ends under to enclose fish. Place packets on a baking sheet and bake for 15 to 18 minutes. Open packets carefully to let steam escape. 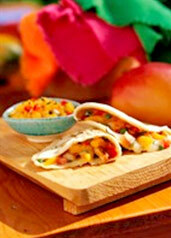 Place equal amounts of cod in each tortilla and top with cabbage, cheese and mango salsa. Season chicken with salt and pepper; reserve. 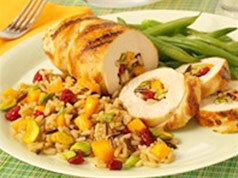 Stir together rice, mango, onion, pistachios, cranberries and spices. Place about 1/3 cup of rice mixture in the center of each chicken breast. (Transfer remaining rice mixture to a hotel pan, cover and heat for service.) Bring in the ends and sides of the chicken breast to enclose rice mixture; tie to secure. Per order, grill over medium-high until cooked through, 5 to 8 minutes, turning to brown on all sides. Serve with an additional 2/3 cup hot rice mixture. Combine oil, chutney, teriyaki sauce and vinegar. Set aside half to use for basting. Cut chicken into 1-1/2 to 2-inch cubes. 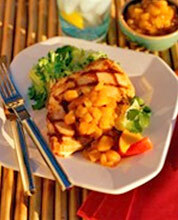 Place chicken and shrimp in wide, shallow glass dish or pan. Pour remaining marinade mixture over, then cover and marinate in refrigerator at least 3 hours or overnight. Soak bamboo skewers in water at least 1 hour before using. Peel onions and trim off both ends. Cut each onion into six wedges, approximately 1/2-inch wide. Separate the wedges into double layers. To prepare kabobs, alternate chicken, onions, mango, green pepper, and shrimp onto soaked skewers, keeping them near the pointed end of each skewer, leaving a long �handle� of skewer open. Coat the grill grate with nonstick cooking spray. Place skewers over medium coals for 15 to 20 minutes. 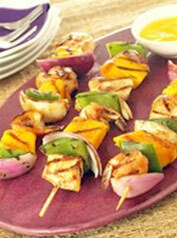 Brush often with remaining marinade mixture and turn skewers until cooked through. 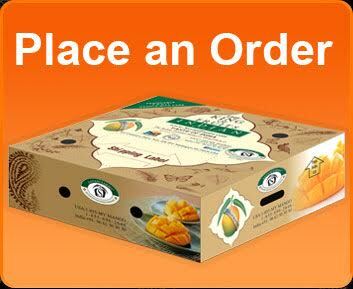 Serve with Ginger Mango Dipping Sauce: Combine pulp from 1 mango (about 1 cup) with 1/4 cup frozen orange juice concentrate, 3 tablespoons water and 2 teaspoons grated fresh ginger root in electric blender. Puree until smooth. Preheat oven to 350°F. Lightly spray a 9-inch baking dish with non stick cooking spray. 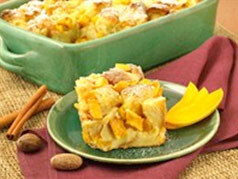 Place bread cubes and mangos in baking dish. In a medium bowl whisk together half and half, egg substitute, sugar, brandy, vanilla, and spices. 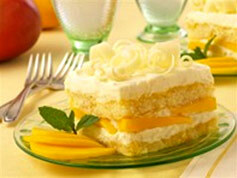 Whisk in butter, then pour over bread and mangos, stirring lightly to coat bread with egg mixture. Let stand for 30 minutes or until liquid is absorbed. Bake for 40 minutes or until a toothpick inserted into the center comes out clean. Heat the butter, pineapple juice, honey, chili powder and cayenne pepper in small saucepan over medium heat; bring to a boil. Reduce the heat and simmer, stirring occasionally, over medium heat, until the mixture begins to thicken slightly, about 10 minutes. Stir in the rum; remove the glaze from the heat. Set aside to cool completely. Brush the slices with some of the glaze and let stand 10 minutes. Spray a nonstick ridged grill pan with nonstick spray and set over medium-high heat. 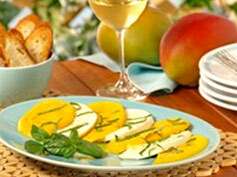 Add the mango slices and grill, turning occasionally, over medium-low heat, until browned and nicely marked, 3 - 5 minutes. 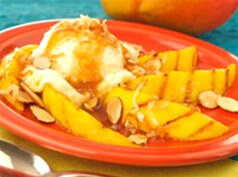 Place two mango slices in each of 4 dessert bowls. 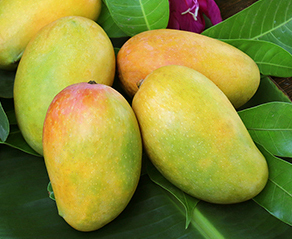 Top each serving with 1 scoop ice cream, 2 tablespoons of the toasted coconut, and 1 tablespoon of the almonds; top with additional mango slices. Drizzle each with the remaining glaze. Serve with the lime wedges. Preheat oven to 375°F. Spray a cookie sheet with nonstick spray and place tart shells on sheet. 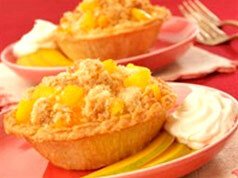 To make the filling: combine the mangos, 1/4 cup sugar, lemon juice and salt in a large bowl; spoon into the tart shells. To make the topping: combine the flour, coconut, cinnamon and the remaining 1/4 cup sugar in a large bowl. Add butter, squeezing mixture together to form a loose ball, then break into small pieces and sprinkle evenly over each tart. Bake until filling is bubbly and topping is golden, about 10 to 12 minutes. Place 10 4-ounce ramekins in a 9x13 baking pan. Spray ramekins lightly with cooking spray. Place the sugar in a medium saucepan. Stir constantly over medium heat, until the sugar melts and turns the color of honey, about 8-10 minutes. Distribute the caramel among the ramekins, working quickly before the caramel hardens. 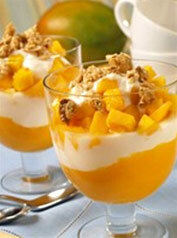 Sprinkle 1 tablespoon diced mango in each ramekin. Set aside. Preheat oven to 350° degrees. Ladle custard over caramel in the ramekins, filling them to 1/2 inch from the rim. Place filled ramekins in a baking dish and pour enough hot water to reach halfway up the sides of the ramekins. Cover baking dish tightly with foil and place in the oven. Bake until flan is set, about 45 minutes (when you tap the edge of a ramekin the flan should still wobble a little in the center). Carefully remove baking dish from oven, remove foil, and let ramekins cool slightly. Using tongs, remove the ramekins from water and set on a towel to cool for at least two hours before serving. 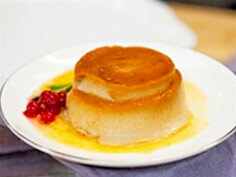 Once it is cooled completely, flan can be refrigerated for up to one day before unmolding and serving. To serve, run a thin knife around the inside edge of the ramekin to loosen flan, and then invert it onto the plate. Add a sprig of mint for garnish.